How did the Allogeneic Stem Cell Transplant affect my blood? 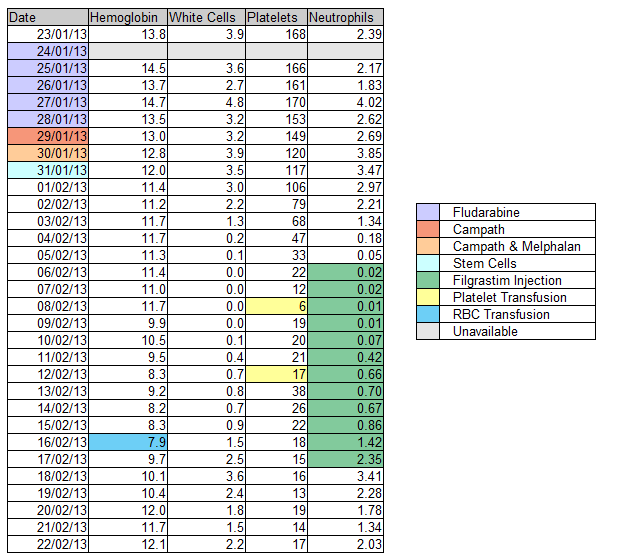 For the duration of my Allogeneic Stem Cell Transplant (Allo-SCT), I kept track of some of the results from my daily blood tests. Why would I do that? Well, putting aside that it's pretty boring being stuck in an isolation room for four weeks or so, i.e. that anything that helps to pass the time is always welcomed, the blood test results provide an indication of progress, as well as when side effects are likely to appear, hence what they show can prove to be quite interesting/useful (at least to me if no-one else). Hemoglobin is the part of each red blood cell that carries oxygen from your lungs to the various tissues around your body, and helps to dispose of the resultant carbon dioxide produced by those tissues. If it drops too low, you tend to start feeling weak/tired and short-of-breath on exertion. Platelets are used in the formation of blood clots. If they drop too low, you tend to bruise and bleed more easily; for example, you may notice what seems like unexplained bruises, nose bleeds or red dots on the skin. 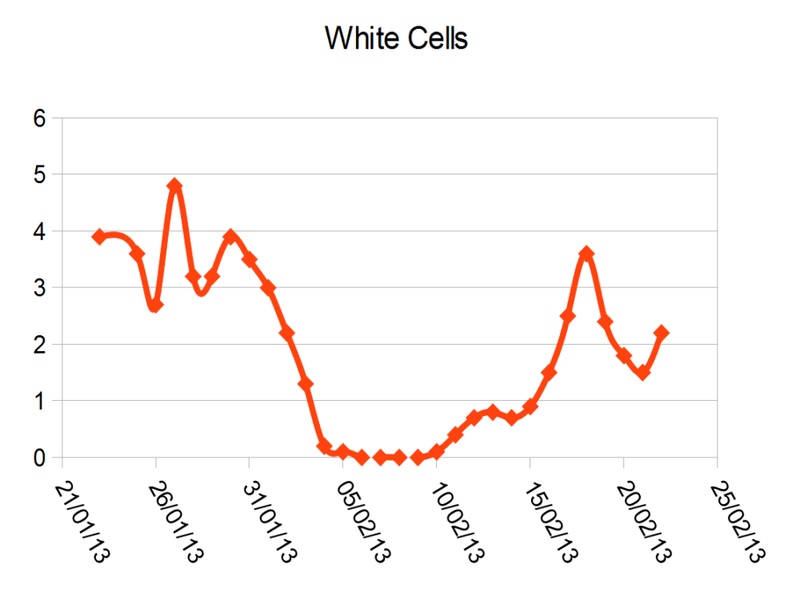 White cells form your immune system, e.g. the defence against infections. If they drop too low, noticeable infections become both more frequent and problematic, as the body is less able to fend them off unassisted. Neutrophils are the most common type of white cell, and are especially important in the defence against bacterial and fungal infections. If they drop too low, the effect is similar to that as with white cells in general. The normal ranges for the blood test results in question does in most instances vary by gender and/or age, and the laboratories often even provide a normal range for their specific equipment, hence there is some variation in the numbers quoted by different sources, but for the purposes of my results they should be as follows: Hemoglobin between 13.1 and 16.6 (g/dL); Platelets between 140 and 370 (x109/L); White cells between 3.5 and 9.5 (x109/L); and Neutrophils between 1.7 and 6.5 (x109/L). Armed with an understanding of the blood test results in question, the images below should help in grasping how the Allo-SCT affected my blood. There are five images in total: a graph for each type of blood test result over time, and a table for the underlying data used to produce them (it also has a key to highlight any relevant events). 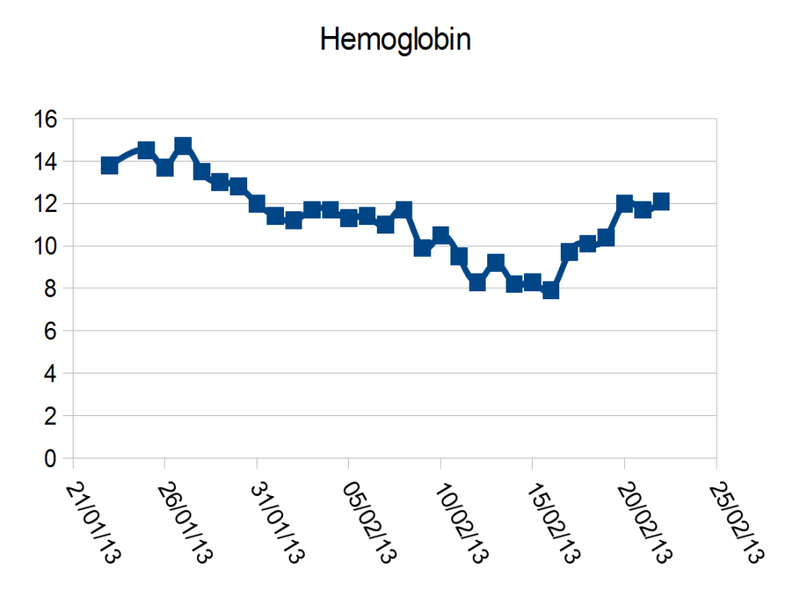 As you can see, immediately prior to the Allo-SCT, my blood test results were normal, albeit only just scraping into the lower-end of the normal range. However, that soon changed, once the treatment got started, which likely comes as no great surprise. Although most of what followed went pretty much as I expected really, I was a little surprised to see that the blood test results fluctuated during the first few days; I had incorrectly assumed that there would simply be a gradual decline. When I asked about the fluctuation, I was informed that it merely demonstrated the body's attempt to compensate for the treatment, before eventually it all became too much to handle. 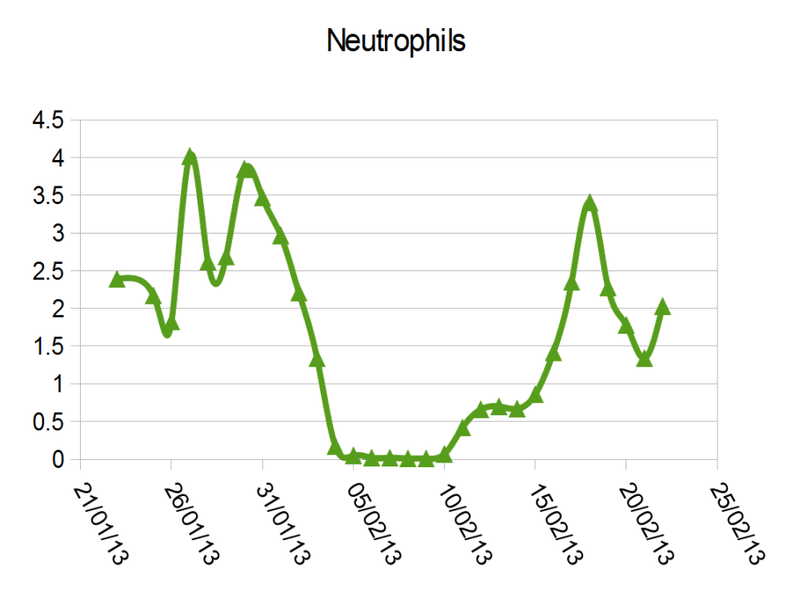 The only other observation that seems worth mentioning relates to the proportion of white cells that are neutrophils. Normally, neutrophils account for roughly between forty-five and seventy-five percent of the white cells (typically about sixty percent) - You may notice that this is reflected in my blood test results immediately prior to the Allo-SCT. However, after my first dose of Campath you can see that the white cells are nearly all neutrophils. The reason is that Campath wipes-out the lymphocytes to achieve its goal, i.e. to reduce the risk of Graft Versus Host Disease (GVHD); Lymphocytes are the second most common type of white cell, account for roughly between fifteen and forty-five percent of the white cells (typically about thirty percent), and are especially important in the defence against viruses and tumours. Note: If you're wondering why I felt the above observation is worth mentioning, it's because it shows how the vast majority of the work was achieved with the first dose of Campath, and therefore illustrates why the second dose resulted in only very mild side effects, i.e. the side effects were nowhere near as harsh as that of the first dose. At the point when I was discharged, i.e. 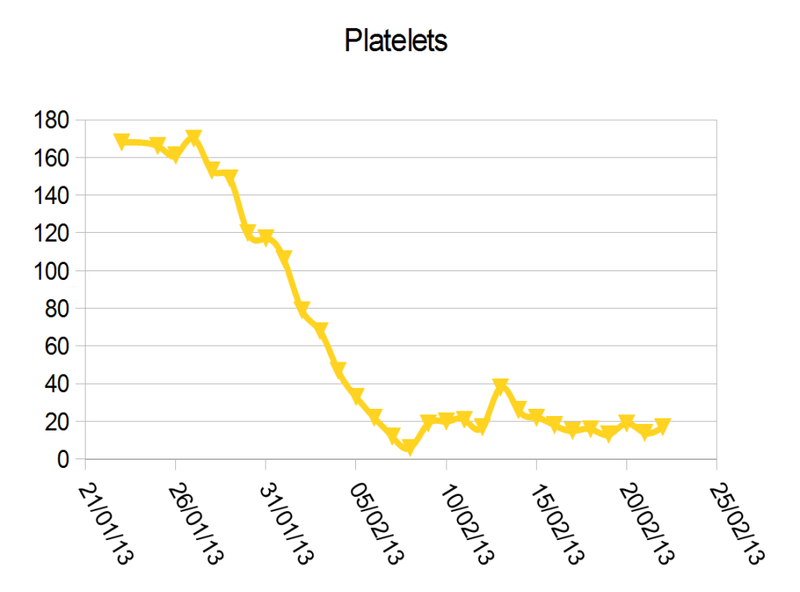 on the same day as the last blood test results shown above, I'd clearly still not fully recovered, as my Hemoglobin, Platelets and White cells were all below the normal range. However, the blood test results had been quite stable for a few days, so the medical team were happy to let me go home. The hope was that as time progressed, the blood test results would gradually improve, but to date that's not entirely been the case. However, that's a story for another post.